Can we say: exceedingly dangerous? 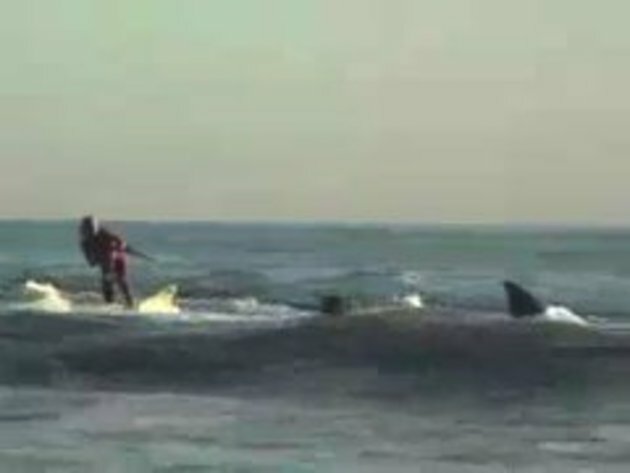 More like exceedingly stupid, that's if this is for real which I highly doubt, check out the fin on the supposed shark and the wave that it leave behind, and don't forgrt to notice the reaction of the other surfers as the shark comes cruising by, pretty calm if you ask me, also notice that there is no snapping on the bait and lets not forget that the fishing line just happened to survive the razor sharp teeth of the shark in question, which is a miracle in it's self. Up until 1:20 i thought it's a girl. Do they feel hero-even-ish(?) for making a stupid video, which is fake and boring ? That "shark" was very fake. Only thing real here was the water! deffently not a real shat, omly motions are stright forward, up side to side, up up and down, i wouth call it a submarine with an back fin and nothing more. u guys are so lol, its a commercial, ofcouse it fake. Don't like it? Too baaadddd!!! !